“It's not just a tour, it's a pilgrimage!" 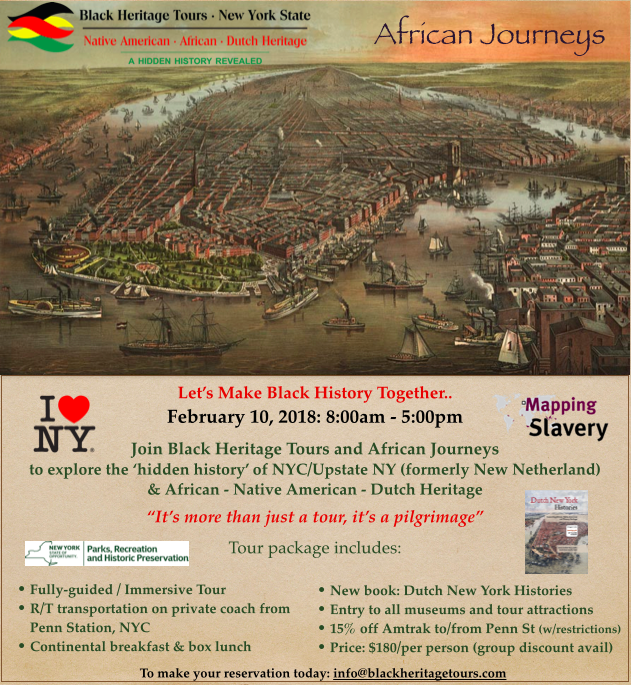 Black Heritage Tours present a fully-immersive experience exploring New York State (formerly the Dutch colony, New Netherland) in a whole new way. Founded by Jennifer Tosch, a descendent of this shared history and co-created by the Mapping Slavery Project; together with their partners, developed this interactive tour to create an authentic cultural heritage experience that goes beyond what most tours offer today. The influence of Dutch culture in New York State is still evident today. It is clearly seen in the architectural heritage, food, city, and street names; and, in many of the present-day celebrations. This is the first tour to connect the history of the Dutch with African and Native American heritage. The tour invites everyone to explore and discover New York State's hidden history, and origins of its earliest inhabitants while visiting historic sites, museums, monuments and local attractions. Experience New York's Fall Foliage starting in Harlem we'll travel upstate through the Hudson River Valley to witness the brilliant transformation of the autumn leaves.